I came across some interesting (delayed) news i.e. Vanguard Canada has introduced 3 new ETFs. As a Vanguard aficionado I had to look into it. These ETFs are a lot similar to the target date funds in the US. However, the asset allocation does not change with time. Each ETF targets specific asset allocation pattern i.e. Canadian bonds, US Stocks, Canadian stocks, developed market stocks/bonds and emerging market stocks/bonds. 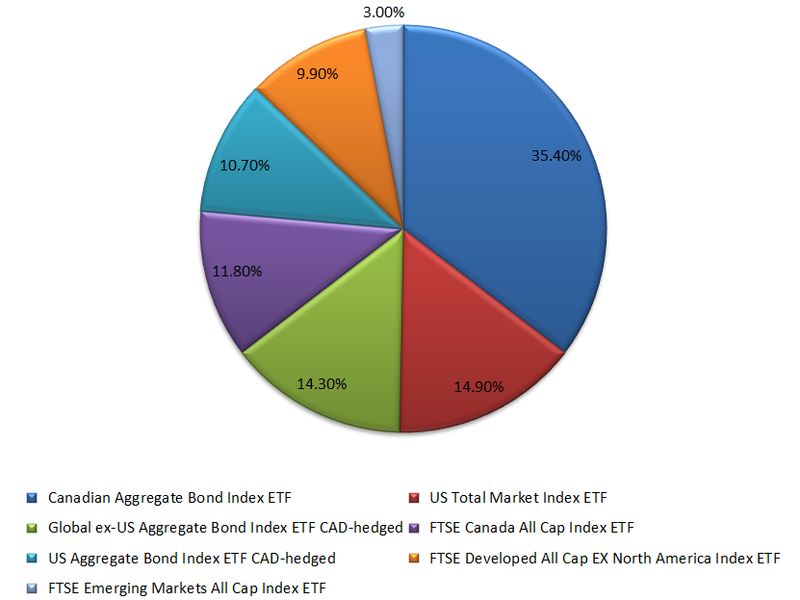 It mimics different allocations using 7 underlying ETFs. Growth ETF seeks to provide long-term capital growth. This is the most aggressive portfolio. 80% is invested in equities and 20% in bonds. Vanguard Conservative ETF seeks to provide a combination of income and moderate long-term capital growth. 40% of the portfolio is invested in equities and 60% in bonds. Vanguard Balanced ETF Portfolio seeks to provide long-term capital growth with a moderate level of income. 60% of the portfolio is invested in equities and 40% in bonds. Each of the above ETFs has a management fee of 0.22%. Corresponding target date funds in the US have expense ratio around 0.16%. Are these ETFs cheap? Since they are fund of funds it is very easy to compute the expense ratio of the holding fund from its constituents (I prepared this table on 26 Feb 2018). The management fee of a corresponding portfolio built by buying individual ETFs comes out to be much cheaper. In the case of VGRO the cost is 57.14% higher. There is a price for convenience. 0.08% might be a small amount. But, please remember that fees tend to compound as well as assets. It is almost impossible to buy fractional shares of ETFs. So, building a diversified portfolio using the underlying ETFs is almost impossible. This is especially true if the capital involved is low. Choosing an asset allocation ETF might be the best strategy in that case. The first major drawback of this portfolio is balancing. Presumably at a younger we should be investing with the growth asset allocation. As we get older we switch to balanced and finally to conservative. The problem is each of these events is taxable? Even though the growth and balanced might have equal amount of Canadian stocks, we have no choice but the sell the entire position and buy it back again. Auto-balancing is a problem too. Asset allocations have to be periodically balanced. This will produce distributions which are taxable. In the worst case you might be at an overall loss and still paying taxes on capital gains. Another problem is the tax efficiency of the underlying assets. Typically index funds (with low capital gains distribution and dividends) are suited for taxable accounts. Bonds are suited for tax-advantaged space. Not all constituents of a fund of funds might be suitable for a particular space. Choosing a fund of funds puts us at a disadvantage in terms of efficiently splitting our investments across taxable and non-taxable space. I am not a big fan of owning international bonds. International investing is risky and I would be happier taking the risk with international equities. But, this is just me. Vanguard totally believes in investing in international bonds. All there asset allocation funds have exposure to international bonds. Finally, all-in-one ETFs employ a high degree of slicing and dicing in building up the portfolio. One of John Bogle’s advice is “not to own too many funds”. I could probably build a much more tax efficient portfolio with lesser number of funds. That being said Vanguard Canada does not have a rich selection of funds when compared to that of Vanguard US. For e.g. 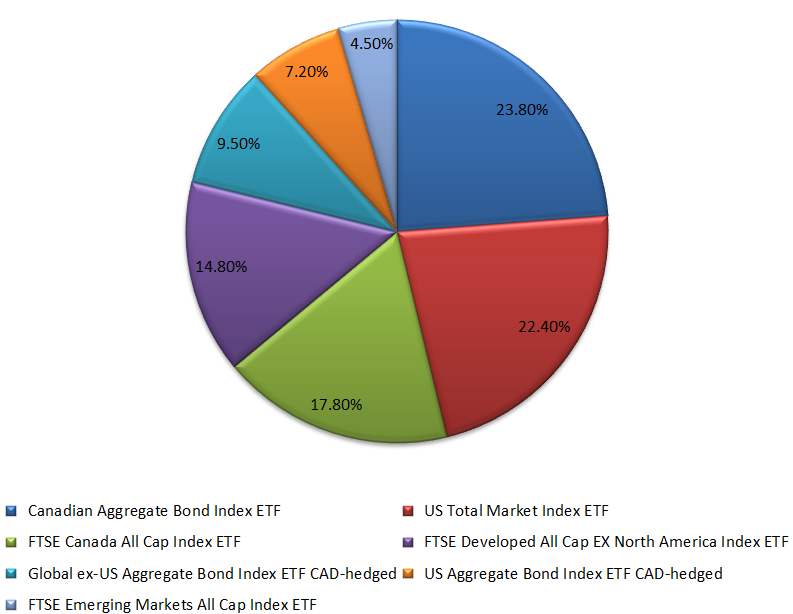 Owning FTSE Global All Cap ex Canada Index ETF (VXC) should pretty much cover the entire international market (US stocks at 53.8%). If we still need additional US exposure i.e. we could have a US tilt by adding Vanguard US Total Market Index ETF. In conclusion, It might probably be worth trying to build a diversified portfolio from scratch. However, without fractional shares it would be very difficult to build such a portfolio. Vanguard All-in-One ETFs definitely provide a well-diversified portfolio with exposure to 4 equities and 3 bonds ETF. There is definitely a premium for this convenience. It might be efficient to place them in the tax-advantaged space. Agree Tom. Its definitely useful for people who don't have the time. I personally like to create my own asset allocation. I am DIY investor and like the lower cost ETF and stocks, but for those who do not like or have investment knowledge these products have a place in a portfolio. With an MER 0.23 you have lots of diversification. I agree with a little bit of knowledge it would probably be worth trying to build a diversified portfolio yourself. 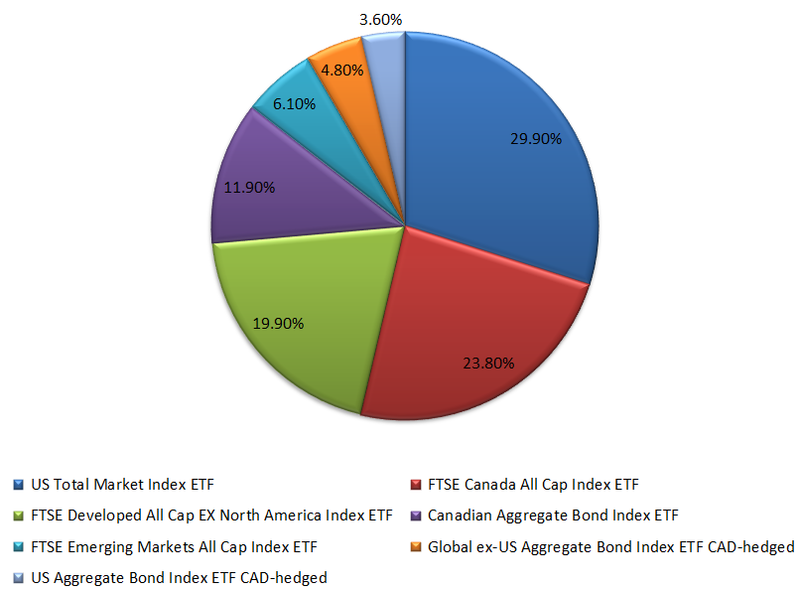 I am kinda appalled by the lack of ETFs in Vanguard Canada. Not much in terms of growth, value etc. For someone starting out with small amount money these funds provide immediate diversification. 0.23 MER is definitely on the higher side.